Carlie and Eric have a quintessential Colorado love story. 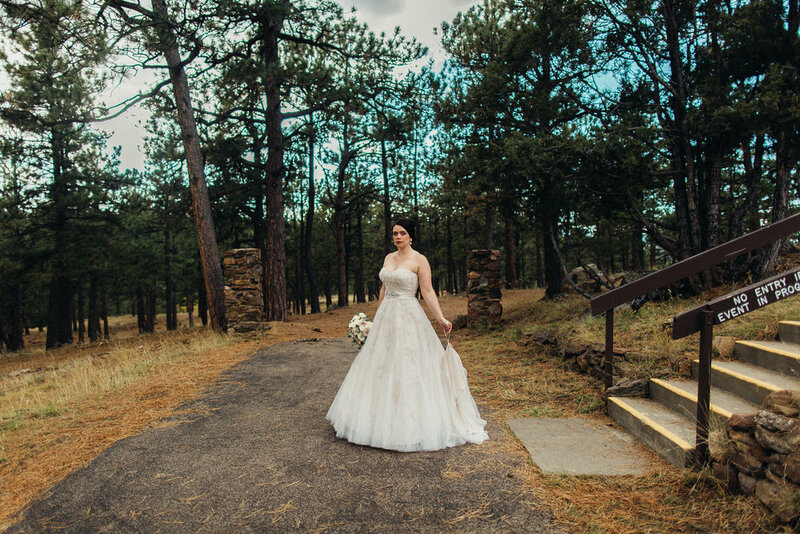 Their first date was in Denver, the bride's ring contains the Colorado state gem stone, and their wedding had a breathtaking mountain backdrop. Read on to learn more from Carlie! The bride and groom were introduced by the groom's uncle. Our first date was in Denver and our love bloomed from there. As seen in the blue aquamarines in the bride's ring (Colorado's state gem stone), their love began in Colorado. The bride and groom got engaged just outside of Portland, Oregon at the bride's favorite place on earth- Multnomah Falls. On the Benson bridge at the falls the groom proposed with a 1.5 carat brilliant cushion cut custom Verragio ring that has features that describe our love story. 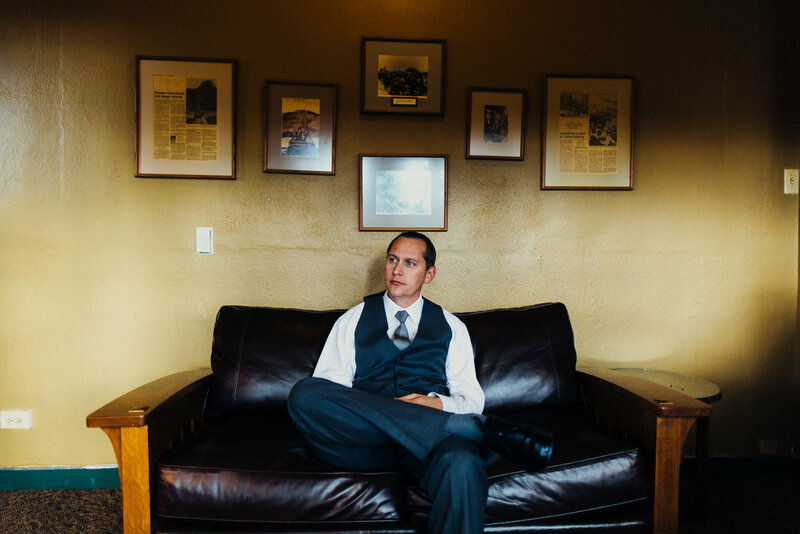 Our wedding was held at the Boettcher Mansion in Golden, Colorado and it was the quintessential Colorado wedding. In front of 85 guests, the bride and groom were married in a traditional Episcopal ceremony with a ceremony to follow. 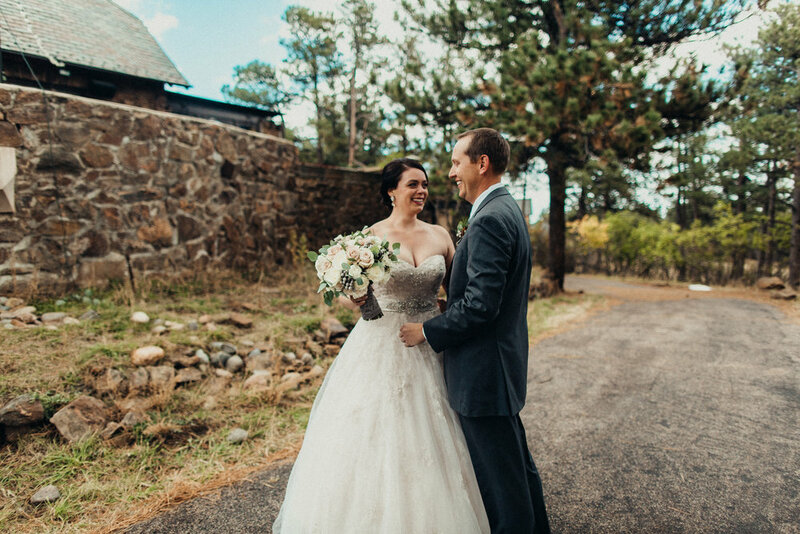 The inspiration behind the wedding day was to amplify the natural beauty of Colorado and the Boettcher mansion itself. Since the mansion is so splendid by itself, muted tones were used instead of bright colors so that the venue could shine. Greys and whites were used in the floral displays along with lots of greenery. 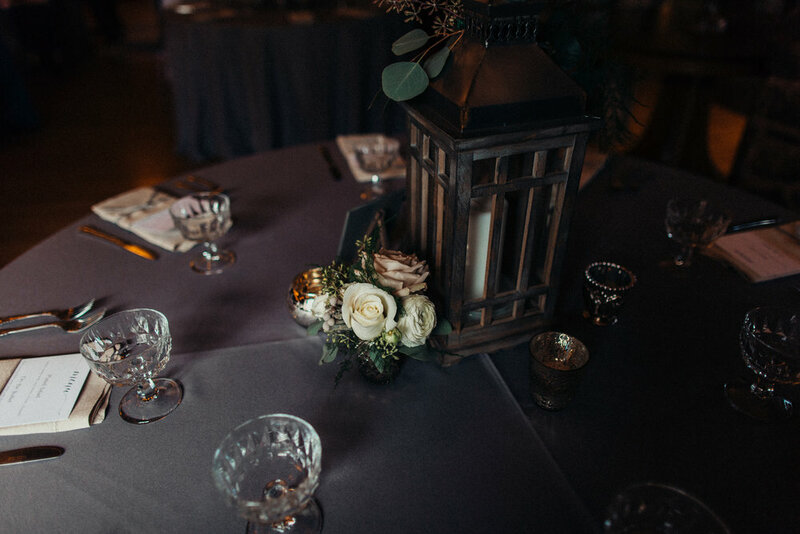 The décor was sophisticated, classy and somewhat vintage as seen in the mercury glass bud vases on the tables and antique looking roses in the bouquets. 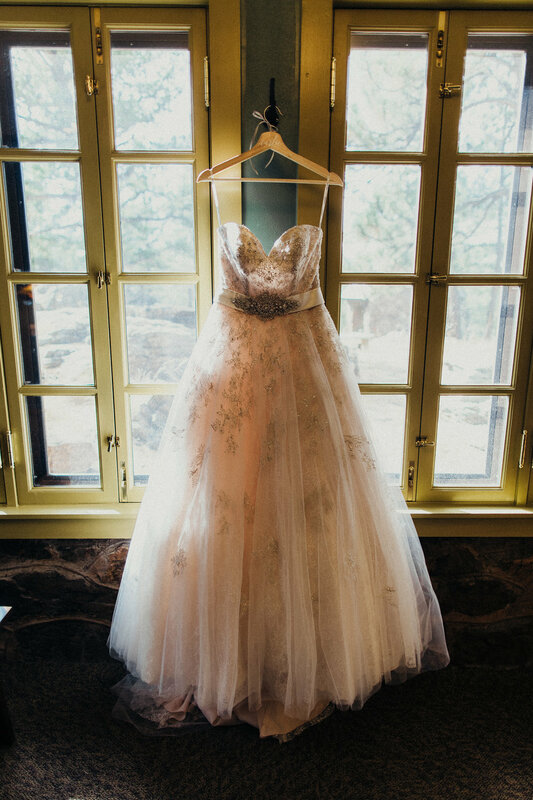 The brides dress was vintage in appearance with a subtle hue of champagne and blush. A piece of the bride's mother's wedding dress was sewn into the bodice. 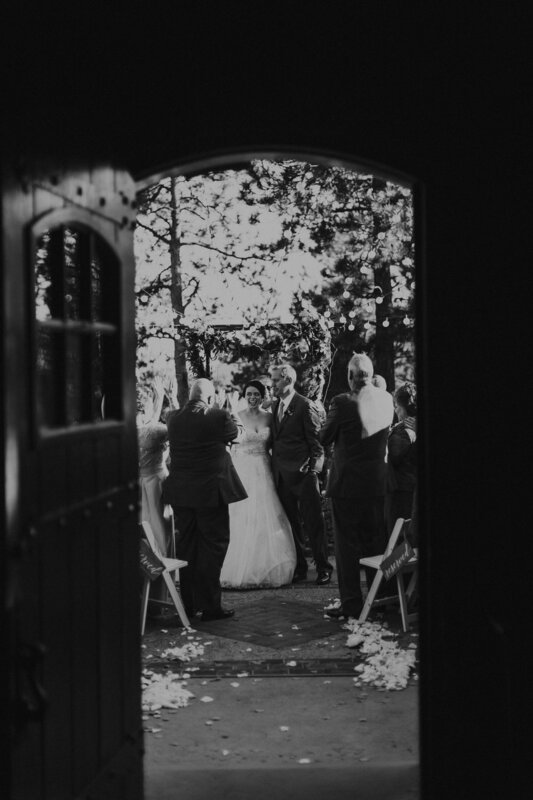 A tradition that has long been followed in Ireland (bride's heritage is Ireland and the couple's first trip was to Ireland) is to ring bells on the wedding day to ward off evil spirits and promote a lifetime of happiness. The send-off at the end of the night was an Irish send off of all the guests ringing wands made by the bride and mother of the bride to follow in this tradition. 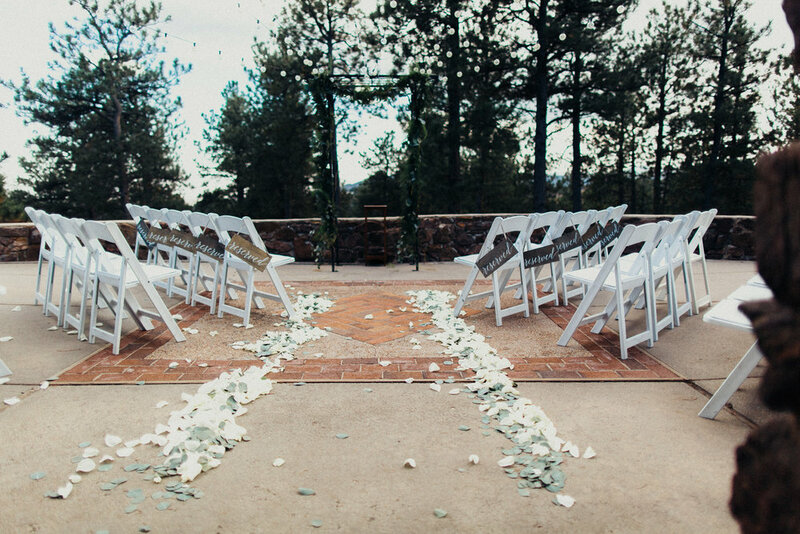 The bride's parents hosted the wedding with a $25,000 budget. The three most important things to the wedding were the venue, catering and flowers and cost was not cut on these three things. It was also important to the bride and groom to have an open bar. When it came to budgeting not much had to be cut out since the budget was so generous. Many things including all signage was hand created by the extremely crafty bride. 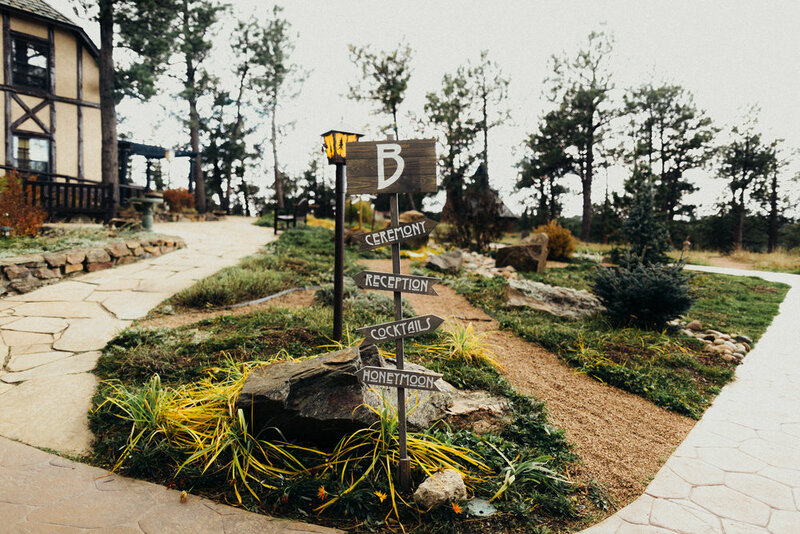 These signs included calligraphy "reserved" signs for the ceremony, a large sign stating "Our Adventure Begins" as guests arrived at the venue, and a large directional sign showing guests where to go. Another thing that was a splurge was the custom made save the dates, wedding invitations, and thank you cards all of which were inspired by the Boettcher Mansion. The florist, Poppy and Pine, and the cake decorator are friends of the bride. 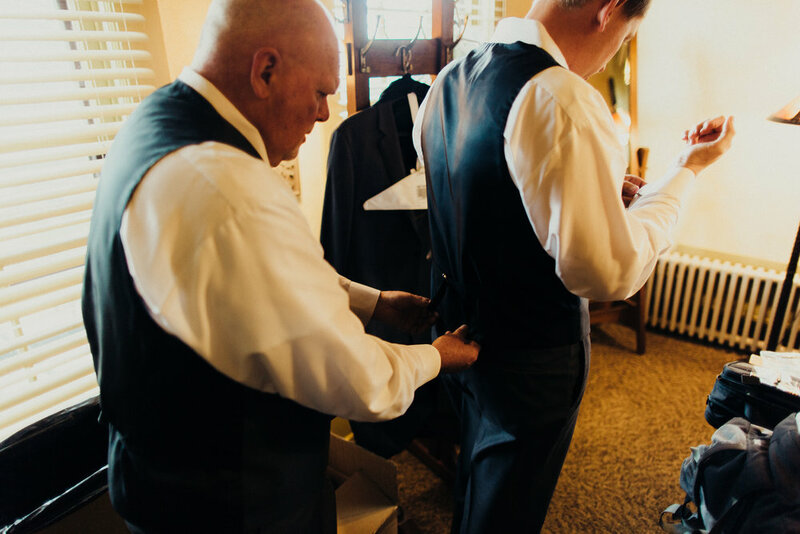 The priest is the family priest of the groom's family. The brother of the bride and sister of the groom each had speaking parts from the Bible in the ceremony. 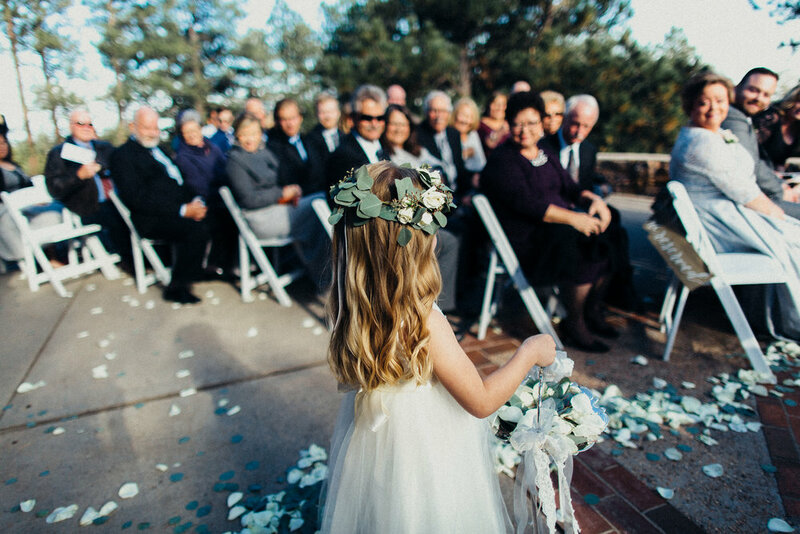 The wedding party consisted of a maid-of-honor and a best man as well as a flower girl (the bride's niece). The flower girl's dress was custom made by an atelier in London, England and was a mini version of the bride's dress. The feathers used in the boutonnieres were harvested from pheasants from the groom's hunting trip. The bride wore light blue Badgley Mischka heals for her something blue. She also had a borrowed hankie, a piece of her mother's dress sewn into her dress (the something old) and the new were her custom made earrings. She also had a sixpence in her shoe. The bride's mother and mother of the groom were given Tiffany and Co. necklaces both featuring hearts for love. The bride also works in cardiology and loves hearts! The ceremony featured a hot chocolate bar and blankets to warm the guests. A violin and cello duo played the traditional ceremony songs as well as throughout cocktail hour. Cocktail hour featured a signature cocktail paying homage to the bride's Irish heritage: Jameson Ginger and Lime. The reception featured calligraphy table numbers done by the bride, lanterns and mercury glass bud vases and candle holders. The table linens were grey with upgraded plates, utensils and glassware. The cuisine was a plated salad followed by a delicious menu at the buffet. A champagne toast followed as well as a toast from the bride's father and then cake cutting. Dancing came next with the first dances on the moonlit mansion patio. The bride and groom and then the bride and her father. The wedding favors were in envelopes hand stamped by the bride with airplane bottle openers as well as "hangover kits: in sickness and in health". My favorite memory from the wedding was when I took a moment to absorb all of our friends and family who had come out to be with us on our special day. Seeing everyone enjoying themselves and being there in support for us was so incredibly touching and emotional. Some challenges were working with certain venders and waiting to get answers to questions. A few other things were just pulling the trigger on large purchases like what to have catered and which flowers to have. At a certain point you just have to decide! The bride was also faced with working full time and trying to plan a wedding in her free time. Looking back, I wish I would have known truly how stressful it all would be. Once the wedding was over the amount of stress was then visible. It's one of those "you don't know how much stress you have until it's gone"
My one tip that was given to me when I was planning a wedding was that the actual day goes by so fast, so take a few moments to sit back and soak it all in. Make sure you love your photographer because you want to be able to relive the day in their photos just like how I feel I can. Now that we are married, I would say pick your battles and ask yourself "is this really worth mentioning or fighting over?" and if it isn't just let it go!